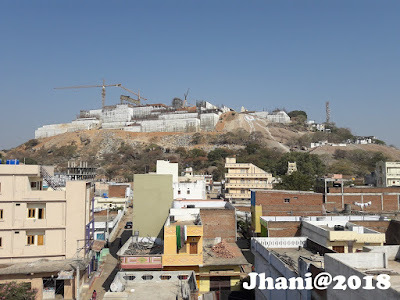 HYDERABAD: With chief minister K Chandrasekhar Rao chalking out plans to develop Yadagirigutta on the lines of Tirumala in Andhra Pradesh, the Telangana police have decided to rope in anti-terror outfit Octopus to create a separate hilltop police station to provide security cover to the shrine. Rachakonda police officials have created a blue print for security at the Yadagirigutta Laxminarasimha Swamy temple, which is being rebuilt on a massive scale and likely to be ready by Dasara next. The proposal was sent to the office of director-general of police (DGP). Prior to that, the officials carried out a study and chalked out nitty-gritty of security planning as Bhongir is a communally-sensitive area. In the past, several terror suspects were nabbed from the area. Hyderabad and surrounding areas have been vulnerable as Islamic State activists in the past made vain bids to create trouble. Senior police officials said there would be a separate law and order and traffic police station on the hilltop, while the Special Protection Force (SPF) would be manning the temple, both for crowd management and other anti-sabotage measures.